As we grow into the CBD Space, the entire industry is learning as we go. Science is rapidly researching the many wonders of hemp and publishing the results of their findings almost daily. Hemp is no stranger to us, whether enriching out diet with hemp seeds and oil, wearing hemp fiber clothing, or cultivating this plant for all its medicinal glory; we are true advocates of this newly freed botanical. We are often asked what makes CBD so good for the skin. We try to keep our answers clear & simple so our customers can easily digest one of many new pieces of information. At Inesscents™ we work with an abundance of botanicals on a daily basis. Some are known for their therapeutic benefits, some for their unique scent profile, and some are the perfect accent to balance a formula. In this, there are also star ingredients. Those that extraordinarily effective for almost all skin types. CBD is one of those botanicals. It can be the perfect addition to an already mindfully crafted product. The CBD we use is full-spectrum and CO2 extracted; meaning we are using the whole plant. Not only does it have Cannabidiol (CBD) but also many other of phytocannabinoids, each having their unique therapeutic profile. This includes fatty acids, terpenes, Vitamin E, a little chlorophyll and a touch of THC (less than .3%). The components of a full-spectrum CBD extract work together with perfect synergy. This is a key element in the results when interacting with our precious skin. We have officially launched our newest Inesscents product category, CBD Botanically Infused Soaps. 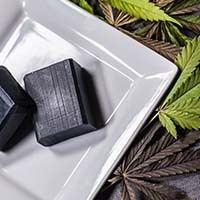 So…Why CBD in soap? The answer is simple. Many of us deal with skin conditions and are trying all kinds of products to soothe, soften, protect, detox, and/or nourish our skin. Choosing the right cleanser can be an essential part of that process. We created three formulations each offering a different function based on individual needs. In true Inesscents style, these soaps are made with certified organic plants and oils + full spectrum CBD to help drive and enhance efficacy. Activated Charcoal has been known to draw bacteria, toxins, chemicals, dirt, oil, and other micro-particles to the surface of the skin. It then absorbs those foreign substances and carries them away when you rinse off. Tea tree oil has antimicrobial and antiseptic properties which make it compliment the use and efficacy of charcoal perfectly. We have filled this soap with activated bamboo charcoal, organic tea tree oil, kaolin clay, turmeric, and marjoram, in a base of organic coconut and olive oil; perfect for drawing out excess oils + toxins from the skin. It smells divine and will leave your skin feeling revitalized. The long standing ‘at home remedies’ of organic colloidal oatmeal, lavender, calendula and chamomile, are well known for supporting irritation. This is the perfect choice for soothing hot, irritated, itchy kind of skin, but also perfect for those who love the luscious scent profile. Along with these medicinal botanicals, we added CBD extract, and well, it doesn’t get much more tranquil than that! If calming things down is what you need, this is the soap for you. Lastly, for all our purists, we have our most simple, but certainly not basic bar of soap – Pure and Unscented. No essential oils, no added herbs, just simply organic coconut oil, organic olive oil and full spectrum CBD. Perfect for the most sensitive skin. We will let CBD’s magic shine though this bar. This is one of many new products categories we are excited to introduce to our consumers. We have been working hard formulating, researching, designing while staying educated, inspired and innovative. It’s all starting to come together in a line that will revolutionize skin care.